LAS VEGAS and BASKING RIDGE, N.J. – Friends coast to coast, across state lines or in the next room will soon jam together playing ROCK BAND™ over a cellular network for the first time. When playing ROCK BAND on select Verizon Wireless 4G LTE smartphones, consumers will be able to rock out with their friends like never before – wherever they are hanging out. 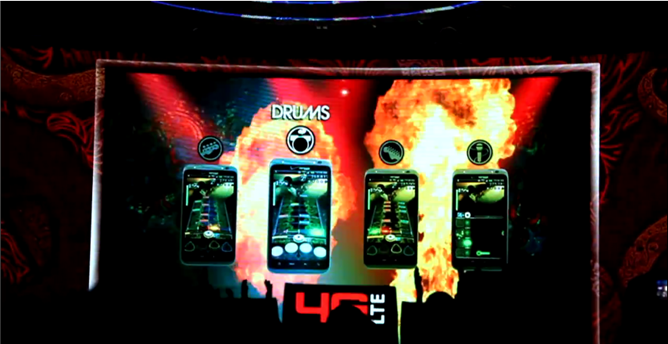 Debuted today during the 2011 International Consumer Electronics Show (CES), ROCK BAND will be coming to select 4G smartphones from Verizon Wireless later this year. Verizon Wireless; EA Mobile™, a division of Electronic Arts Inc. (NASDAQ: ERTS); Harmonix Music Systems Inc., the world’s premier music video game developer; and MTV Games, a part of Viacom’s MTV Networks (NYSE: VIA and VIA.B) announced the new ROCK BAND game today. Packed with favorite hits, ROCK BAND will be ideal for music lovers looking to rock out on guitar, bass, drums and vocals. A Quick Play mode will provide casual jam sessions, and players can hit the road to rock sold-out stadiums in Tour Mode. Buddy Lists, a feature exclusive to ROCK BAND on select Verizon Wireless 4G LTE devices, will allow players to join games, locate others they have recently played with and search for friends. EA Mobile worked directly with Verizon Wireless to optimize ROCK BAND for Verizon Wireless’ fast 4G LTE network. Looks like a good time. I just wish Verizon wasn't hogging all of the Android announcements at CES, but I'll take what I can get.